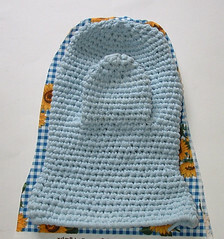 I think most people know the yarn you can create from recycling old t-shirts is called t-yarn or tarn. 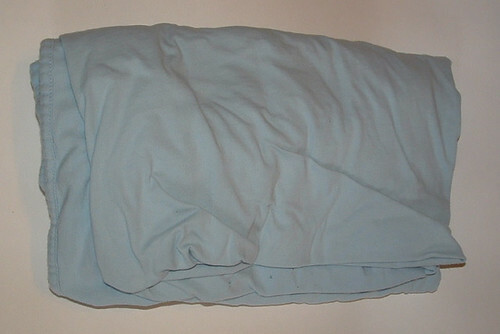 But did you know that you can also recycle old cotton jersey sheets to make the same type of material? I recycled an old cotton sheet to create this crocheted oven mitt. I cut the sheet into very thin strips and curled it as outlined in t-yarn making tutorial. I used half a twin sheet which is probably less than two t-shirts should be using tees to make your oven mitt. Here is my cotton sheet before I started. I was lucky to get it free from the rag box at my local thrift store as it had a few holes and some minor discoloration. As you cut the strips you can work around any holes and the color differences really don’t show in the yarn that is created. 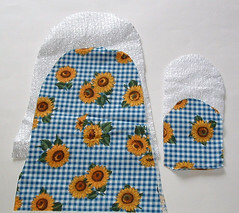 This recycled oven mitt project fits a woman’s size medium hand. Should you need a larger mitt, just do a few more rounds as indicated in the crochet pattern below. As always, I hope you enjoy my free pattern and have fun creating your own t-yarn oven mitt. Using t-yarn, Ch 44 and join with a Sl St to form a ring. My ring was approx. 7 inches wide if measured flat. Do NOT turn your work in this project. This project is worked in rounds. Ch 1, Sc in ea st around. Don’t join from this point on. Just continue working in rounds. Work Sc in each st around. See how there is a natural fold created with your project. End each round at the fold which should be where your tail is from the beginning chain. Work 1 dec by working two Sc’s tog at natural edge of fold. Then Sc in ea st around to other fold, work 1 dec by working two Sc’s tog. Finish rnd by working Sc in remaining sts. Work Sc even around in ea st.
Repeat Rnd 4 and 5 Twice. Sc in ea of the next 6 sts, skip 10 sts for thumb opening. Ch 12 and sc in the remaining 6 sts of side. Then Sc in remaining sts on the other side of mitt so you should be back at the beg of rnd at side of mitt. Check your thumb opening to make sure its centered. If you have a few less or more sts on ea side of your mitt, just adjust your opening as needed so its centered on that side of mitt. Leave the opening as you work the remaining body of the mitt. 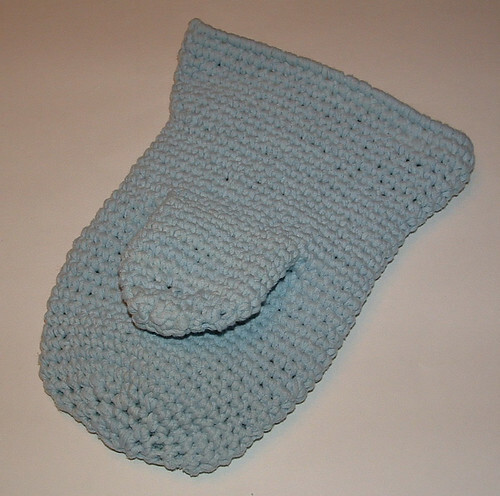 You will add the thumb when the mitt is completed. Sc in ea st and in ea st of the chain for the thumb opening. Again you end rnd at side of mitt. Sc in ea st around. Sc in ea st and work 2 Sc tog (1 dec) at center of thumb opening. Finish rnd with Sc in remaining sts. Sc in ea st of rnd. Sc in ea st and work 2 Sc tog (1 dec) at center of thumb opening. Starting at side edge of mitt, *work 2 Sc tog (1 dec) then Sc in next st.* Repeat between * around. 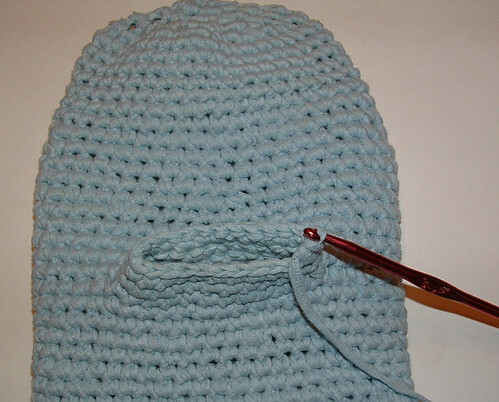 Leaving a tail at the end, use the tail to close the opening at the end of mitt. FO. Attach t-yarn at front right corner of thumb opening, Sc around opening in ea st. Don’t join but just continue working around. At side edge *work 2 Sc tog (1 dec) then work a Sc in ea of the next two sts. * Repeat between * around. Sc in ea st. Leaving a tail at the end, use the tail to close the opening at the end of thumb. FO. 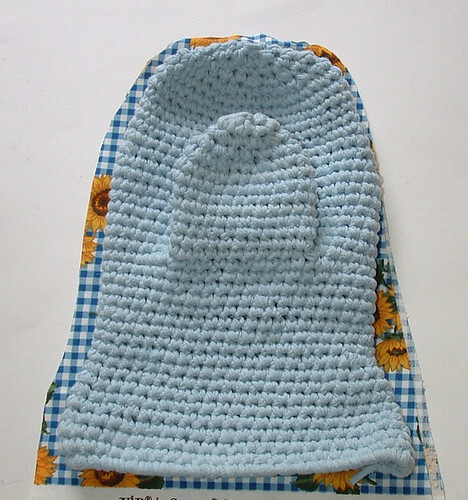 Line your t-yarn oven mitt with one layer of fabric and one layer of insul-bright just for added protection. I just place the oven mitt on the fabric and insulation material and cut around the outside allowing a little extra for the seams. I did the same for the thumb. 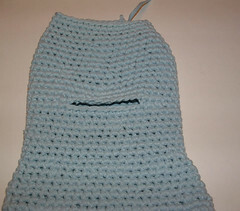 Sew the materials together with wrong sides facing out for the fabric and insert it inside your oven mitt and stitch in place along the lower edge. 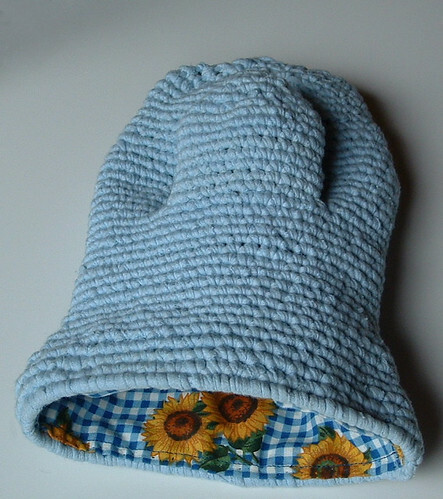 Update: I just finished my lining tutorial and have added it to this crocheted oven mitt project post. This is an excellent tutorial. 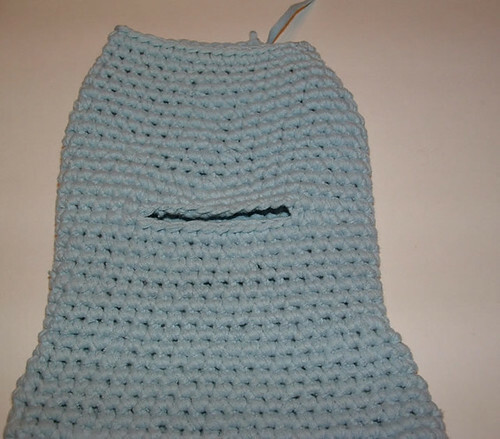 The only thing I’ve really made with t-yarn is a hotpad. I really like how thick and soft it is. 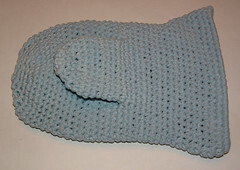 This would be excellent for an oven mitt. I like how you added the fabric liner as well. Will definitely put this one on my to do list for future projects.